When I was six months pregnant with Emmy, we went on a vacation to the Great Smoky Mountains National Park. I took this picture of the clouds when we were in Cherokee, North Carolina. We rented a cabin in the mountains near Cherokee, and we loved staying on this side of the park. There was less hustle and bustle, and much less traffic than on the northern side of the park! This picture shows that same sky, with Ed and Lily sitting by the sign welcoming visitors to Cherokee. 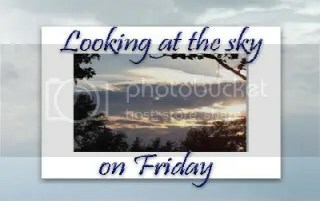 Looking at the Sky on Friday is hosted by Tisha at CrAzY Working Mom.